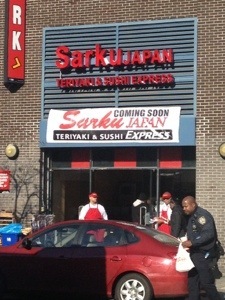 Sarku Japan and Sushi Express opens on 125th Street in Harlem | HarlemGal Inc. 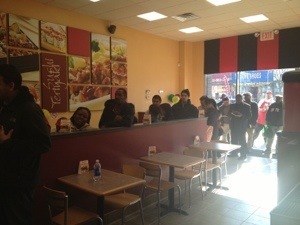 In a news release, Sarku Japan®, the largest Japanese Quick Service Restaurant chain in the U.S., announced yesterday that they opened a store on 125th Street between Adam Clayton Powell, Jr. Blvd., and Lenox Avenue in Harlem, this past weekend. Harlemites will be able to order from Sarku Japan® Teriyaki and Sushi Express “sizzling teriyaki and made-to-order sushi” that is traditionally found in mall food courts. To learn more about Sarku Japan, click here. This entry was posted in 125th Street, Adam Clayton Powell Jr. Blvd., business, food, Harlem, Lenox Lounge and tagged 125th street, fast food, Food, food courts, Harlem, Sarku Japan®, Sarku Japan® Teriyaki and Sushi Express. Bookmark the permalink. is that next to the Golden Crust? Wonder when Harlem is going to open up a good Diner?!! @natasha. I hear ya. Someone would make a killing in South Harlem if they opened up a diner! And I believe this is near Marshall’s and CVS. I ate there this afternoon and was under-impressed. The food presentation was like what you would get at an Halal cart. Taste was disappointing too. The food was no where near as good as there competitor’s Yoshinoya. I took some pictures and wrote a review on Yelp, if your interested. Sorry to hear the food was not good. Hopefully the owners will see the feedback here and on Yelp; and react! What’s the number to this place? I love Japanese so I am interested in trying out another option in the neighborhood. What were your impressions of the food?